On one of my recent menu plans, I shared a photo of this cauliflower, and several of you wanted the recipe. 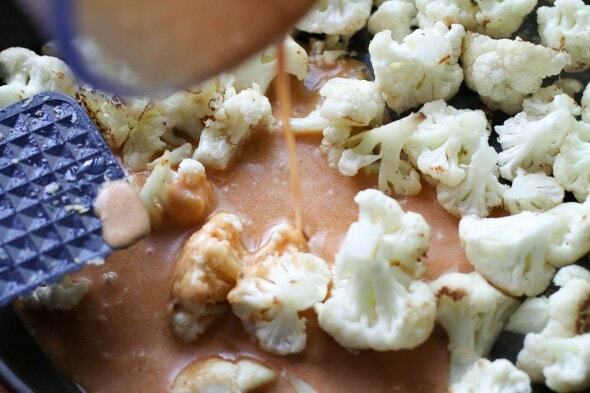 No one at my house adore cauliflower, but this recipe made it palatable to almost everyone. 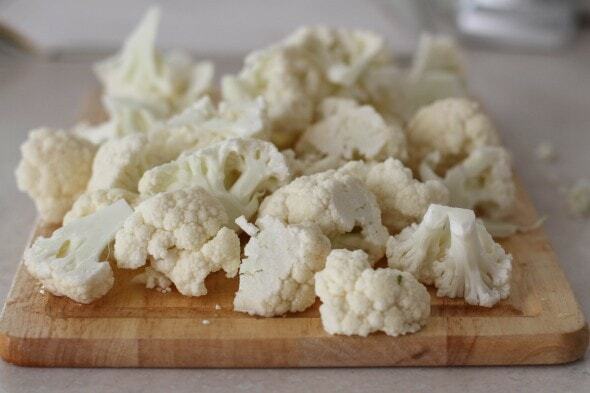 I think it’s because when the cauliflower cooks in a flavorful sauce, it tastes less…cauliflowery. And that’s a happy thing for my family. I found the recipe in my big Cook’s Illustrated cookbook as I was searching for ways to use the cauliflower my produce box sent me. 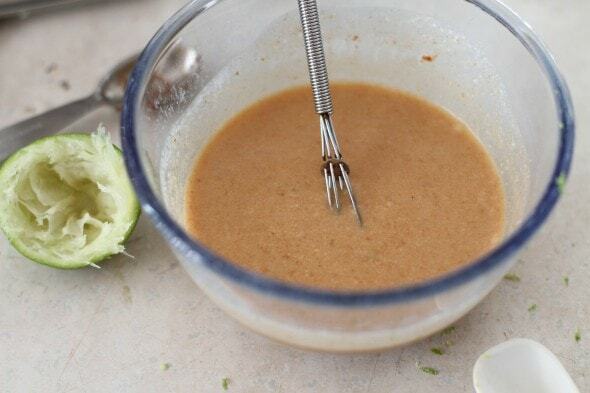 First up, you mix fish sauce, lime zest and juice, sugar, and red pepper in a bowl until the sugar is dissolved. Add coconut milk and curry paste, and the sauce is done. I would never in a million years have put this combination of ingredients together, but it somehow works. Next up, heat a tablespoon of oil in a nonstick or cast iron skillet until the oil is shimmering. 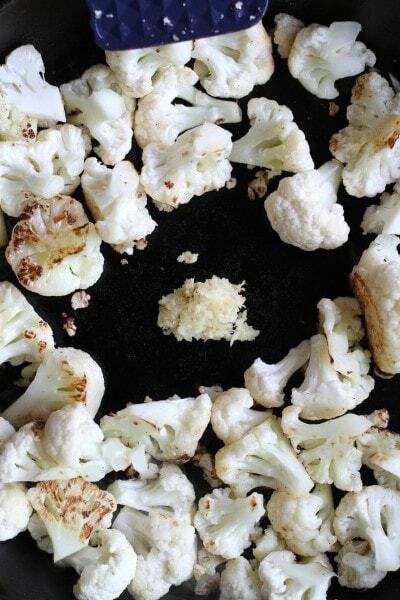 While the oil is heating up, cut your cauliflower into small, 3/4 inch florets. Add the cauliflower to the hot pan, and cook the florets for about 3 minutes, or until they’re barely tender. The original recipe says to stir every 10-15 seconds, but I let mine sit still more than that, so they get nice and browned. While the cauliflower browns, mince your ginger and garlic. Clear the cauliflower away from the center of the pan, and add oil, garlic and ginger. Let them cook for about 30 seconds, and then stir the oil/garlic/ginger into the cauliflower. 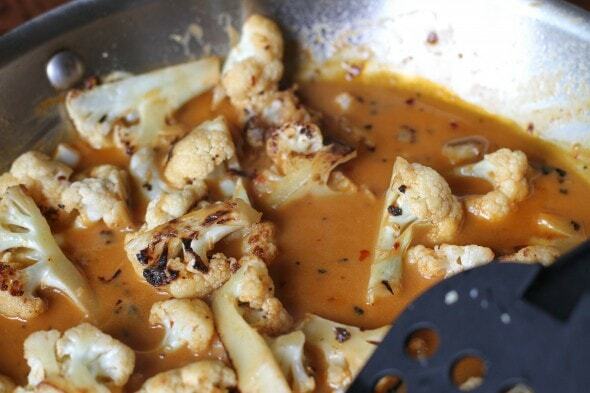 …and simmer the cauliflower in the sauce for about 5 minutes, or until it’s as tender as you like it to be. The original recipe calls for sprinkling the cauliflower with fresh basil leaves, but I haven’t had them on hand. So, feel free to add them, but I’d say the cauliflower is quite edible even without the basil. 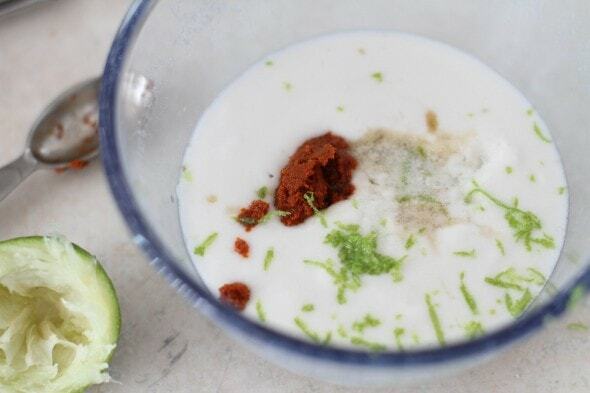 For Thai Sauce Base: Mix fish sauce, lime zest and juice, sugar, and red pepper in small bowl until sugar is dissolved. Add coconut milk and curry paste to Thai Sauce Base, and whisk in bowl until smooth; set aside. 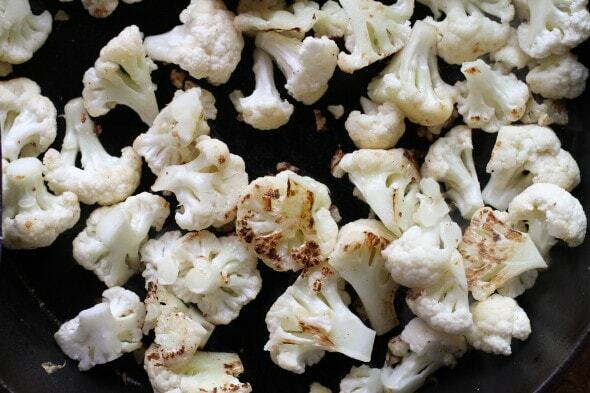 To Cook Cauliflower: Heat 1 tablespoon oil in 12-inch nonstick skillet over high heat until shimmering, 2 to 3 minutes. Add cauliflower and cook, stirring every 10 to 15 seconds, until just barely tender, about 3 minutes. Push cauliflower to sides of skillet, clearing center of pan. Add remaining teaspoon oil, garlic, and ginger to center of pan and mash with back of spoon; cook until fragrant, about 30 seconds, then stir mixture into cauliflower. Reduce heat to medium-high; stir in sauce mixture. Simmer, stirring occasionally, until cauliflower is tender, about 5 minutes. Sprinkle with basil; serve immediately. What do you serve this with? I have a Caribbean Shrimp it would be perfect with and I love cauliflower so thanks for the recipe! I just serve it like I would serve sauteed green beans or steamed broccoli…as a veggie side. I know we’ve had it with burgers, and I can’t remember what else! Ooooh, thanks for sharing! We’ve been looking for more vegetarian dishes to eat more healthily, and this looks great! I’m pretty Picky about my veggies, but I would definitely eat this. Do you eat it as-is or serve on a bed of rice? We’ve always eaten it as a side dish, but you can serve it over rice as a main dish. You can also stir in snap peas during the last few minutes to give it more variety as a main dish. Is this spicy, especially for younger children? It depends on how spicy your curry paste is. I believe you can get mild or hot curry paste, so if you guys don’t love spice, opt for the mild. And maybe use fewer red pepper flakes until you’re sure how spicy the curry paste is? Talk to me about fish sauce. I hate hate hate fish, but I see this as an ingredient in a lot of recipes that I don’t think would taste fishy- does it make things taste fishy? Can you taste it at all? The fish sauce brand I use (and sorry, can’t think of it) is not fishy tasting. It doesn’t add fish taste to other dishes. It’s the only brand I can find locally, so I can’t tell you about others. You can always substitute soy sauce for fish sauce in recipes. Fish sauce is a disgusting-smelling liquid that somehow manages not to make the dish you use it in disgustingly-flavored. And yeah, it doesn’t really impart a fishy flavor. I’ve been a vegetarian for over 25 years, so I’m very sensitive to fishy smells. I use fish sauce on occasion and can attest that it imparts a unique flavor, but does not taste fishy. What it does contain is an obscene amount of salt. Check the label before you buy and use sparingly. This looks really good and we aren’t big cauli fans either. We’ve found that we like it mashed or roasted with spices. But otherwise? Nah! I’ll have to try this; we like curries. We like cauliflower but usually serve it with cheese of some kind. This sounds like a nice change of pace! Same here! Cauliflower and cheese in my house. But I’d like to try this one. I’ve shied away from many recipes because of the fish sauce. Maybe I should try some if you really can’t taste it. I’m so glad you posted this! I’ve been wanting to make it, and will probably make it with dinner tonight! This is the same sauce I use when I make coconut shrimp which includes red peppers, snow peas or any other veggie and shrimp. I serve it over rice. Next time I will add a little cauliflower along with the other veggies. Perfect! 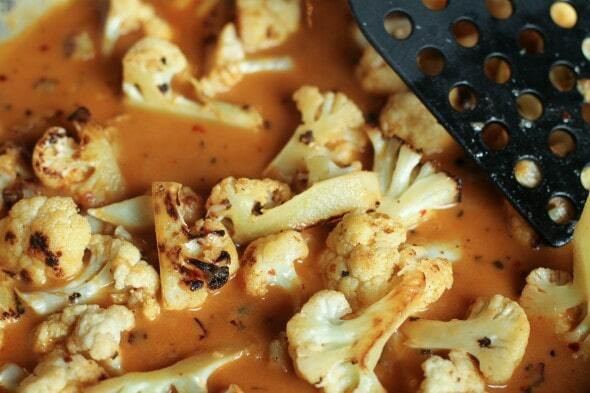 I love red curry, and used to feel lukewarm about cauliflower until I discovered how delicious it is when roasted.